Copy of program for a 1717 production of Bach's cantatas. A cantata (Italian for sung) is a vocal music composition with an instrumental accompaniment and generally containing more than one movement. The term did not exist prior to the sixteenth century, when all "high cultured" music was vocal, but with the rise of instrumental music in the seventeenth century the term emerged as the instrumental art became sufficiently developed to be embodied in the sonata form. From the middle of the seventeenth century until late in the eighteenth century a favorite form of Italian chamber music was the cantata for one or two solo voices, with accompaniment of harpsichord and perhaps a few other solo instruments. It consisted at first of a declamatory narrative or scene in recitative, held together by a primitive aria repeated at intervals. Fine examples may be found in the church music of Giacomo Carissimi; and the English vocal solos of Henry Purcell (such as Mad Tom and Mad Bess) show the utmost that can be made of this archaic form. With the rise of the Da Capo aria the cantata became a group of two or three arias joined by recitative. George Frideric Handel's numerous Italian duets and trios are examples on a rather large scale. His Latin motet Silete Venti, for soprano solo, shows the use of this form in church music. The Italian solo cantata tended, when on a large scale, to become indistinguishable from a scene in an opera, in the same way the church cantata, solo or choral, is indistinguishable from a small oratorio or portion of an oratorio. This is equally evident whether we examine the unparalleled church cantatas of Bach, of which nearly 200 are extant (see list of cantatas by Johann Sebastian Bach), or the Chandos Anthems of Handel. In Johann Sebastian Bach's case many of the larger cantatas are actually called oratorios; and the Christmas Oratorio is a collection of six church cantatas actually intended for performance on six different days, though together forming as complete an artistic whole as any classical oratorio. Bass solo from Ad pedes, the first part of Dieterich Buxtehude's oratorio Membra Jesu Nostri, one of a cycle of seven cantatas. The essential point, however, in Bach's church cantatas is that they formed part of a church service. Many of Bach's greatest cantatas begin with an elaborate chorus followed by a couple of arias and recitatives, and end with a plain chorale. This has often been commented upon as an example of Bach's indifference to artistic climax in the work as a whole. But no one will maintain this who realizes the place which the church cantata occupied in the Lutheran church service. The text was carefully based upon the gospel or lessons for the day; unless the cantata was short the sermon probably took place after the first chorus or one of the arias, and the congregation joined in the final chorale. Thus the unity of the service was the unity of the music; and, in the cases where all the movements of the cantata were founded on one and the same chorale-tune, this unity has never been equaled, except by those sixteenth-century masses and motets which are founded upon the Gregorian tones of the festival for which they are written. In modern times the term cantata is applied almost exclusively to choral, as distinguished from solo vocal music. It is just possible to recognize as a distinct artistic type that kind of early nineteenth-century cantata in which the chorus is the vehicle for music more lyric and songlike than the oratorio style, though at the same time not excluding the possibility of a brilliant climax in the shape of a light order of fugue. Ludwig van Beethoven's Glorreiche Augenblick is a brilliant pot-boiler in this style; Carl Maria von Weber's Jubel Cantata is a typical specimen, and Felix Mendelssohn's Walpurgisnacht is the classic. 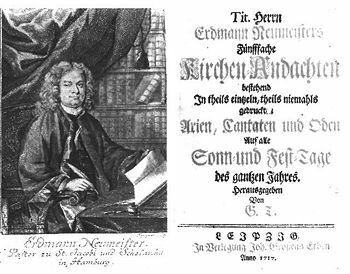 Mendelssohn's Symphony Cantata, the Lobgesang, is a hybrid work, partly in the oratorio style. It is preceded by three symphonic movements, a device avowedly suggested by Beethoven's ninth symphony; but the analogy is not accurate, as Beethoven's work is a symphony of which the fourth movement is a choral finale of essentially single design, whereas Mendelssohn's Symphony Cantata is a cantata with three symphonic preludes. The full lyric possibilities of a string of choral songs were realized at last by Johannes Brahms in his Rinaldo, set to a text which Goethe wrote at the same time as he wrote that of the Walpurgisnacht. The remaining types of cantata (beginning with Beethoven's Meeres-stille, and including most of Brahms's and many notable English small choral works) are merely so many different ways of setting to choral music a poem which is just too long to be comprised in one movement. This page was last modified on 2 April 2008, at 04:03.